“We truly enjoyed your class on Saturday,” said J. Clark after coming to her first workshop with her husband. Six people attended my 43rd ‘Ukulele Strumming Workshop on November 18 bringing the total to 526 served since the workshops began on July 14, 2012. The one visitor from Canada had taken lessons and workshops from me previously. One of the new participants had won a free ukulele during the giveaways last Saturday, November 11 at the 10th Annual Maui Ukulele Guild Exhibition and had also seen us perform with two groups on stage. Most of the attendees were local Maui residents experiencing their first ukulele lesson with me. Many were new ‘ukulele players so we spent time on the fundamentals of how to hold the instrument, form basic chords with minimal muscle strain, and strum easy strums taught by no one else. 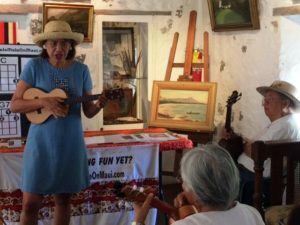 Register now for the next Ukulele Strumming Workshop on Saturday, December 16 at 10 a.m. at the Bailey House in Wailuku.